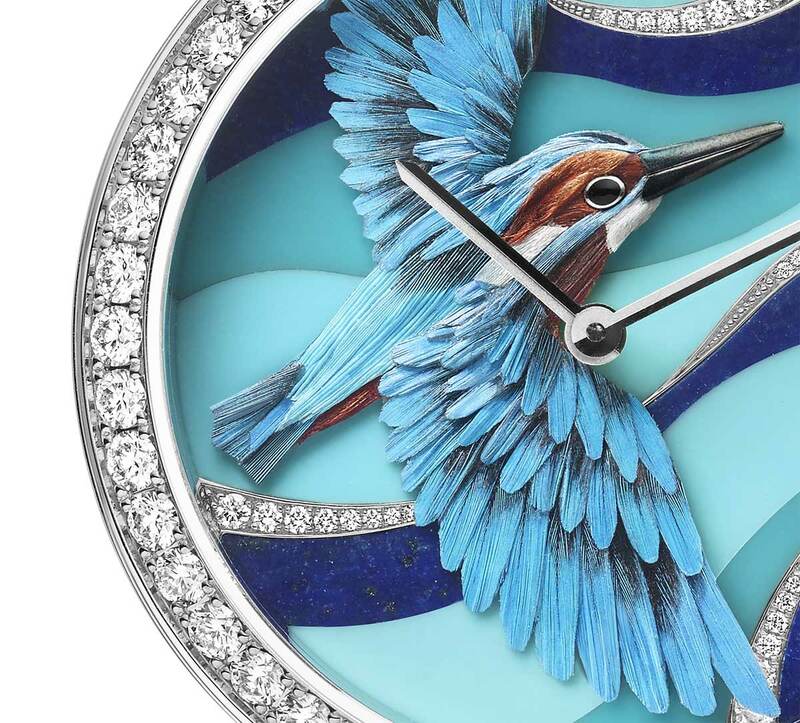 For Watches & Wonders 2015, Van Cleef & Arpels showcased a new savoir-faire expanding its Extraordinary Dials collection with three limited edition timepieces where engraving on gold or hard stone marquetry are combined to miniature feather art with natural feathers to suggest the beauty of birds, a first for Van Cleef & Arpels. 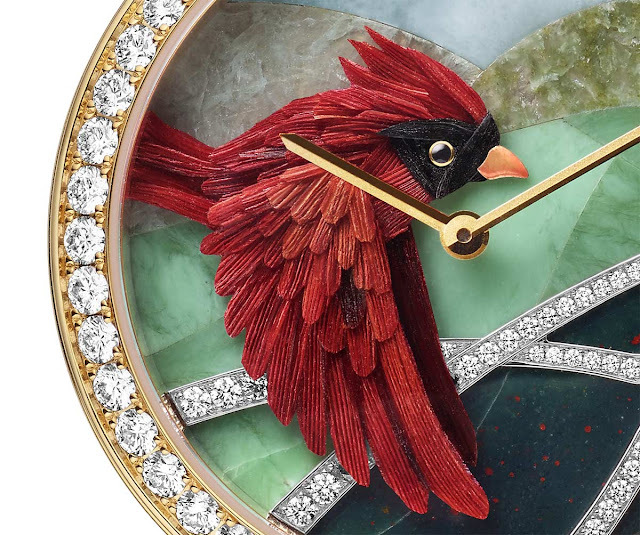 To create the Lady Arpels Oiseaux Enchantés models, Van Cleef & Arpels partnered with Nelly Saunier, the feather artist who created these incredibly detailed three-dimensional birds with shimmering natural plumage. 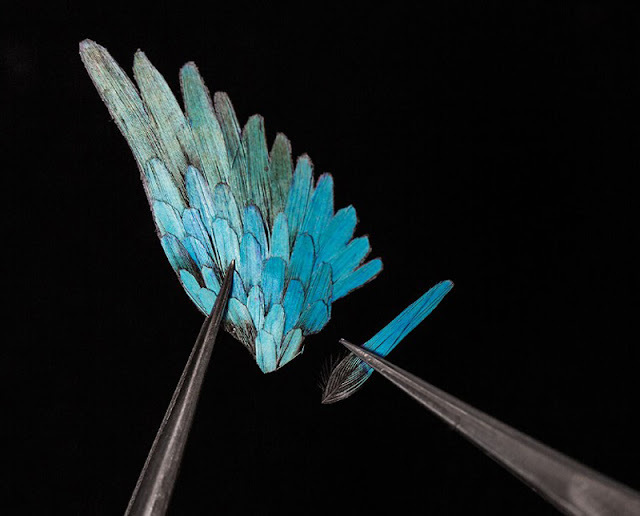 The barbs and barbules are removed from the feathers and carefully prepared to correspond to the original drawing. 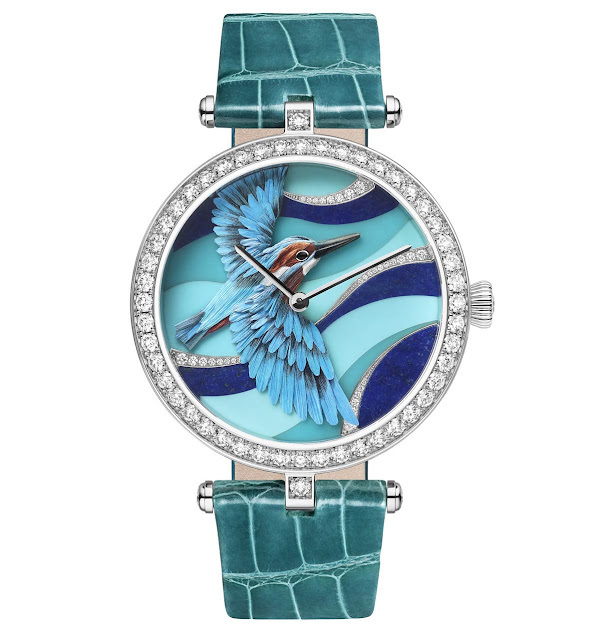 They are then combined, shaped and positioned to match the form of the bird. 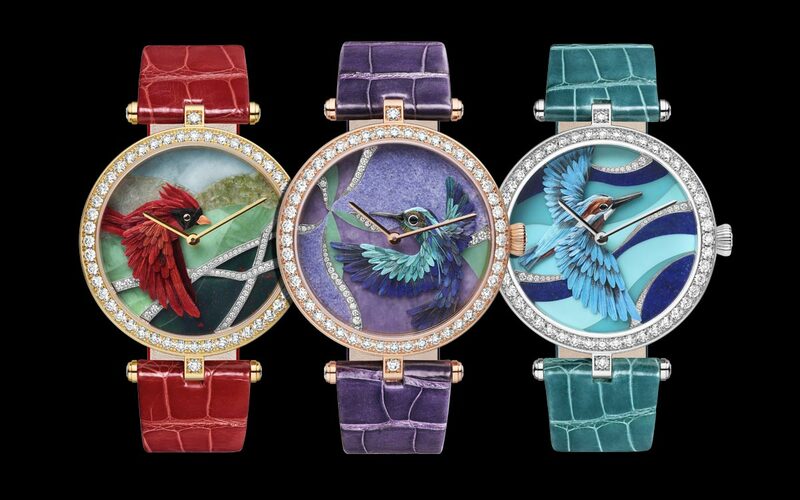 Produced in three limited editions of 22 pieces each, the Oiseaux Enchantés timepieces are crafted from yellow gold, pink gold and white gold. The case has a diameter of 38 mm with bezel and crown set with diamonds. The back cases are engraved with with motifs echoing the story of the dial. 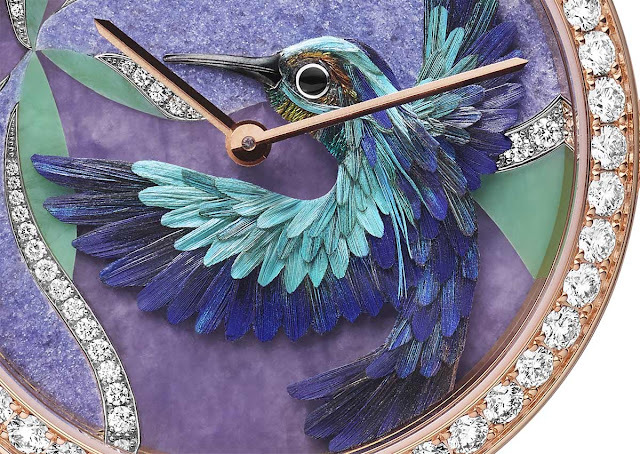 A hummingbird in shades of indigo hovers over a flower of diamonds and hard stone marquetry composed of lavender jade, lepidolite and variscite. On the back of the case, the engraved bird gathers nectar from the surrounding flowers. 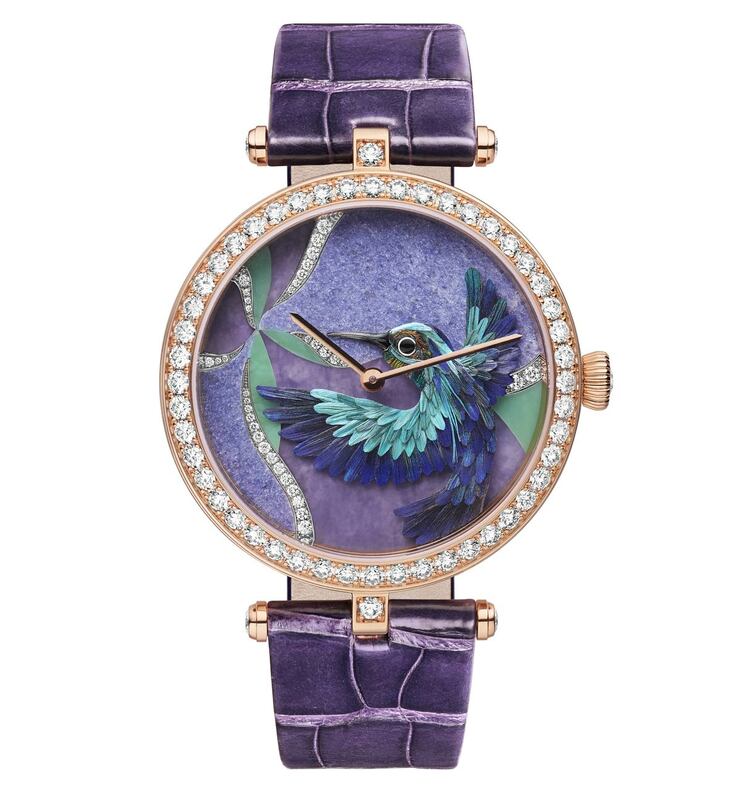 Van Cleef & Arpels - Lady Arpels Oiseaux Enchantés. 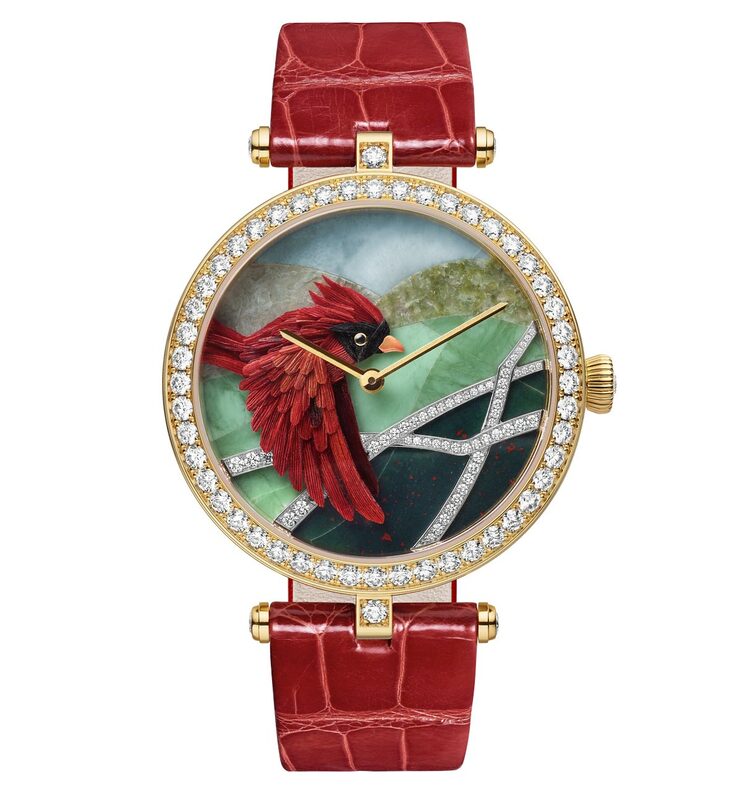 For Watches & Wonders 2015, Van Cleef & Arpels showcased a new savoir-faire expanding its Extraordinary Dials collection with three limited edition timepieces where engraving on gold or hard stone marquetry are combined to miniature feather art with natural feathers to suggest the beauty of birds, a first for Van Cleef & Arpels.